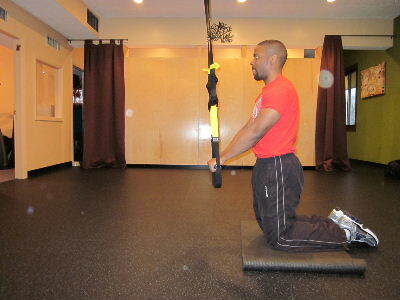 There are a variety of trx ab exercises that you can include in your workout routine. Many trx exercises will work the abs from a plank position, but you can also work the abs and core while standing or kneeling. 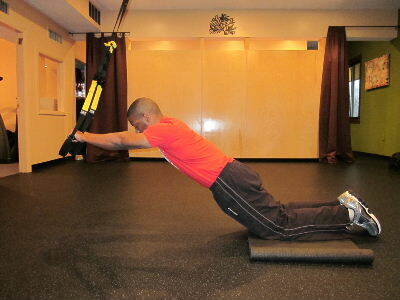 This page features the kneeling plank rollout with the Trx. This is definitely an advanced exercise, and it will significantly challenge the lower back. You should definitely build up your abdominal strength with basic ab exercises before progressing to more challenging exercises. Below you can see pictures of this exercise and read a little more about why it places so much pressure on your lower back. Form: While keeping your abs and core engaged and your arms straight, slowly extend your arms out in front of you. Move as far forwards as you can before you feel your lower back moving out of good alignment and hold at that position for a brief second before returning to the starting position. Personal Trainer Tips: As mentioned earlier, this is an advanced exercise that places a lot of pressure on the lower back. As you extend forward, gravity will pull your body weight down and you lower back will have the tendency to arch excessively. When the lower back arches excessively, additional pressure is placed on the joints of the lumbar spine. If you have strong abs, you will be able to keep your body in good alignment and protect your lower back. If you are worried about your lower back but want to try this exercise, limit your range of motion in the beginning. If you only go half way out with your arms there will be less pressure than if you fully extend. It is also important to keep your abs engaged throughout the movement. Many people tend to bend from the waist, but in this exercise your pelvis and lower back should stay solid like in the regular plank. This exercise is very similar to plank roll outs with the ab wheel or the stability ball plank roll out. Each exercise variation will challenge the lower back. So start slow, build up your strength, and listen to your body.